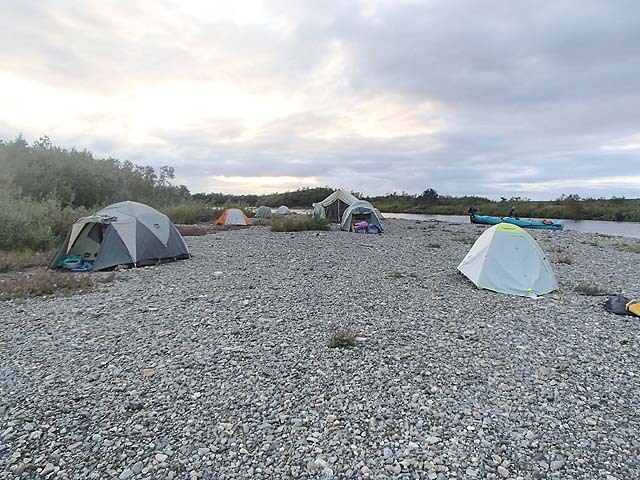 This a is a brief account of a seven day float trip in August 2015 of about fifty miles down the Arolik River to Kuskowim Bay, which is bit north of Bristol Bay. I went with Ouzel Expeditions, my second trip with them, and I'll be doing more. Getting there is half the fun. Having arrived in Anchorage on a Sunday, the next morning I flew out to Bethel, the Paris of western Alaska. It does have a concrete runway so Alaska Airlines flies jets out there, but it's a dry town. I sat out a day of bad flying weather there, Then with several Cessna loads the group got to a decent gravel airstrip near the village of Quinhagak. From there we transferred to a capable looking little traildragger with huge tundra tires for mutiple shuttles out to a gravel bar on the Arolik. I took three bamboo rods on this trip of my own design and construction, two of them 10 ï¿½ ' switch rods for 400 grain lines and one single hand 6 weight. 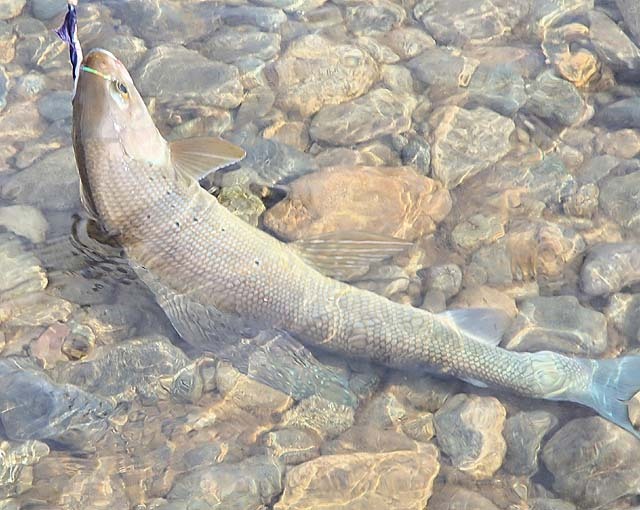 Since our start point on the river was below the heavier concentrations of grayling, the 6 weight stayed in its case the whole trip. With the switch rods I fished with a 20 ft. skagit head, mostly with floating tip, but occasionally with a T8 tip. The killer fly of the trip was the Dalai Lama. The Ouzel guys were quite efficent at getting a camp set up with a cook and dining tent with chairs, handy for getting waders on and off out of possible rainy weather. They were similarly effective at getting things going in the morning. All I had to do was take care of my own stuff. The food was great with good variety. 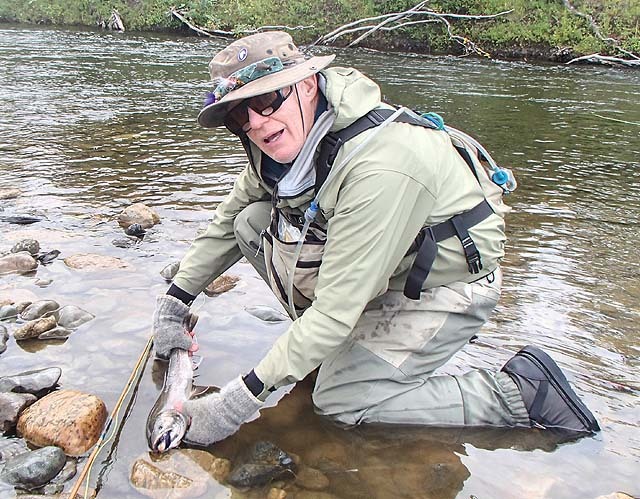 Although we mostly released fish, the menu did include a few we kept of arctic char and silver salmon. That close to the Bering Sea, we had a lot of overcast weather, but not much rain, and that mostly drizzle rather than downpour. We did seen the sun occasionally. We saw one bear in the distance the first day and that was it for large carnivores. We weren't completely out of grayling country, here's a beauty that I landed. The 3" long Dalai Lama in its mouth scales its size. 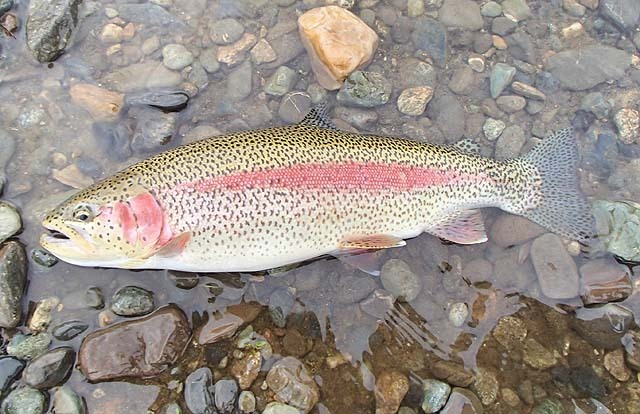 Then there were the rainbows—gorgeously spotted “leopard” rainbows with lots of fight. I managed to break one of the switch rods with a little too much bend in it trying to land one from the raft. It was a four piece rod with two tips. Unfortunately it broke in the second section, for which I had no spare. With that rod hors de combat I was very careful with the other. But being a maker of rods, I can take the attitude “I make 'em, I fish 'em, I break 'em, I fix 'em.” I have a replacement section finished for a trip to the Klamath next week. Then there were the arctic char and the dollies (Dolly Vardens). Of course the premier fish of the trip were the silver salmon. Here's a gnarly colored up buck with his “Jimmy Durante” nose that I landed with some effort. 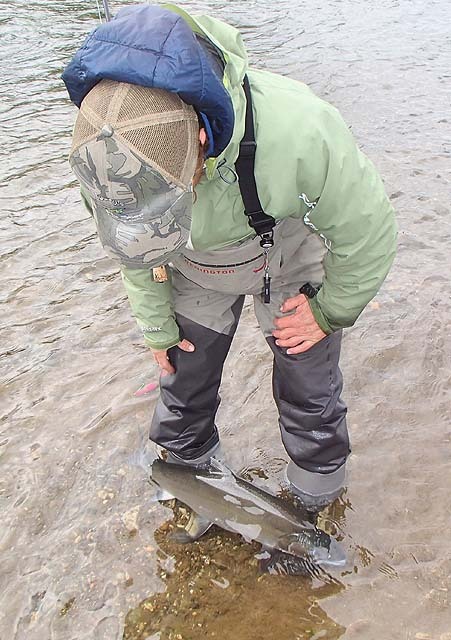 One of the fish I landed hung around for several minutes at the feet of one of our guides before taking off. 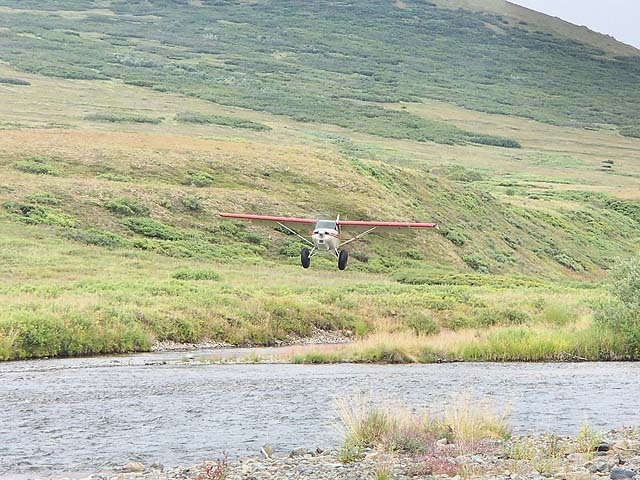 So the trip went on seven days ending up close to the mouth of the river where we were picked up by one of the locals and taken back to the gravel strip for the flight back to Bethel and on the the fleshpots of Anchorage.